Overview | Vision | Mission | Accreditation, Approvals and Recognition | Why Choose CMRCBS? 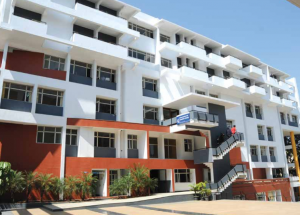 CMR Centre for Business Studies (Est.2009) is a Flagship Institute of CMR Group of Institutions, powerfully advocates inclusive and equitable Management education and promotes lifelong learning opportunities for all. We oﬀer quality, Pragmatic education through our interrelated programs of instruction and analysis. We have a tendency to promote discovery development, dissemination and preservation of knowledge and believe in equipping students by taking them out of the Lecture rooms and exposing them to their actual sensible field of work. We strongly and firmly believe in replacing rot learning with creativity. Intune with this the CMR Life Skills Institute partners with us in providing a competitive edge to unlock the inventive potential of the scholars. A stand alone Master in Business Administration (MBA) Program go past the Institute and caters to the wants of all sections of Global society. The rigorous educational program a game changer enabled the student’s community to be the most eﬀective in terms of profitable employment and eﬀort Entrepreneurial skills through Management education at CMRCBS. To be the best Management School in the country and ultimately recognized as the world class Centre of Excellence in providing innovative value based education and training for leadership qualities to meet the needs of the society. To provide excellent Infrastructural facilities for the course work and for enrichment of knowledge. To develop the leaders capable of managing change and transformation in a globally competitive environment. To strive and develop socially conscious leaders, entrepreneurs and managers through excellence in management education, research, training and consultancy. To create avenues for employees Intellectual, Cultural, Personal and Professional growth. CMR brand of education in the Silicon Valley is driven by experiential learning and we ensure paid internship to all the deserving students. We emphasis learning, relearning and unlearning the three yard sticks to fashion and prepare industry ready talent. A university curriculum with an amalgam of talented faculty and students makes a big diﬀerence in Management education. The state of the art infrastructure with the best of the facilities and accessibility. Highly talented and committed faculty drawn both from Academia and the Industry. Rigorous academic pursuit coupled with Industry Internships, Placement assistance and a host of supportive activities. Skill oriented events and activities in terms of Case Studies, Projects, Industry Internships, Management Fests and inter collegiate activities. Our Academic achievements have been laudable. MS. Sri Vidya has secured a GOLD Medal in HR and Mr. Karthik was placed 4th in MBA Rank list of Bengaluru University. I am sure we will have more such impressive achievements in the coming years.